In May, Rick Lowry, the editor of The National Review, a right-wing fortnightly magazine in the USA, walked through a hotel kitchen to get to the stage at an event that Presidential hopeful Jeb Bush was speaking at. What Lowry saw happen was important. 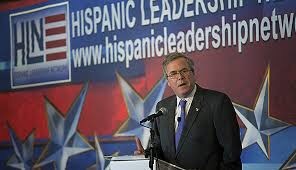 Jeb Bush is a fluent Spanish speaker who met his wife in Mexico. He has always had a view on immigration that is far less strict than other Republicans. In a country where the Hispanic populations growing day by day this is becoming more and more vital for someone who wants to win the Presidential election. The problem is that to win that election you have to win the Republican nomination, and that, at the moment is hard to do without being shrilly hardline about immigrants. The problem with the approach that may appeal most to the Republican core is that they cannot win back the White House if they get only 25% of the Latino vote at the 2016 election, which is what their nominee Mitt Romney got in 2012. Jeb Bush has great name recognition and an unparelleled fundraising and political organisation. Yes, half of the name that is recognised is ‘Bush’, but George W Bush isn’t quite as unpopular in Republican circles as you might think. Furthermore, Jeb had an excellent record as a Governor of Florida, both on financial and social issues. It is a record any conservative would be proud of, but isn’t quite cutting through as much as much as it would normally because this Republican field is particularly wide and talented. Bush is older than Marco Rubio and Scott Walker, but he does possess the temperament and seriousness to make him a serious Presidential candidate. Not for him the haunted look of a candidate who knows he is out of his depth, Jeb does authority very well. Given some clear policy positions, he really does have a very good chance to win the Republican nomination. If he does, it could be the Latino vote wot’ll win the White House back. « Are the right wing press getting Jeremy Corbyn’s PM chances all wrong?